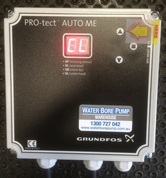 The Grundfos PRO-tect ASYNCHRONOS MOTOR PROTECTION device is designed to protect the pump from dry running by stopping the motor when a low current draw situation is present. The unit restarts the pump after time delay allowing the water level to recover and the pump to run normally until a fault reoccurs. The unit also protects the motor from overload and under or over voltage faults. The display will indicate the status of the power supply to the motor and a code will indicate the fault. 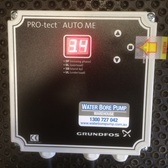 It is designed to suit Grundfos pumps and will extend the warranty of a new pump and motor installed with a PRO-tec. Incoming single phase 230 volt power is connected to the input side of the terminal bar as marked. The motor cable is connected as pictured, taking note that the terminal marked main is the neutral and the common is active. Fit the cover install the pump and prepare to calibrate the unit. 1. Plug the unit in to the power supply and turn on. Ensure the rocker switch is in the on position. The unit will power up and flash mains frequency in Hz. 2. To run the pump select the auto calibration mode by pressing the up arrow once to display At. 4. Press the square button to confirm the selection. The current draw of the motor will be displayed in Amps. 5. 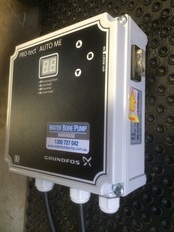 Allow the pump to run, build up pressure and run in it at normal flow and pressure conditions for a minute or two. 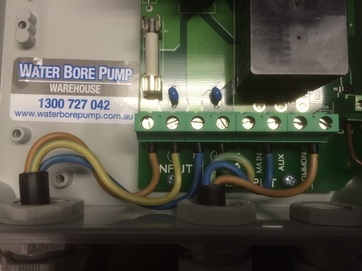 6.When the pump system has settled down and the amp draw is constant press the up arrow again to start the self calibration process. The display will flash CL indicating calibration learn. 7. Press the square button to confirm auto calibration. The unit is now calibrated ready to protect you pump system. Test the unit by shutting the discharge valve, stopping the water flow. The current draw will decrease as the pressure rises. The unit will trip the power supply to the pump. Re-set using the on/off rocker switch. 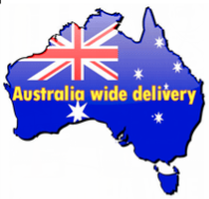 Other mode and further instructions are included in the Installation and Operating Instructions included with the packaged unit.